The other day I noticed that my December 2009 blog post, "2010: The Year Marketing Dies," was my blog's most popular article. Here it is, 2012, and CMOs are still employed and Marketing Departments still exist. Oops! Should I be embarrassed? Before you answer that, I would like to make the case that Marketing is already dead, but marketers just don't know it yet. 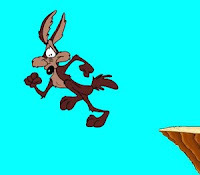 Like Wile E. Coyote after he has dashed off the edge of the cliff but before gravity has kicked in, I think the profession of Marketing is hovering and waiting for a fall. I will cop to employing some hyperbole in both my December 2009 blog post and the one you are reading now, but less than you might think. Exaggeration aside, the discipline of marketing has some profound and painful changes coming. Earlier this month, Taco Bell irked customers with an insanely misguided promotional tweet on Martin Luther King, Jr. Day about the "dream" of "eating @TacoBell." In November, Qantas Airlines blundered badly with a hashtag marketing campaign that people appropriated to gripe about the carrier having canceled flights and stranded passengers. In September, Unilever sparked a "Ragu Hates Dads" meme with an insulting ad campaign that slighted fathers. It is important to note that I am not citing cases of mistakes or service blunders that became social media disasters (a la PayPal/Regretsy, Chrysler's F-bomb or GoDaddy's Elephant-Killing CEO). Nor are these examples of consumers taking to social media to rail against corporate policies (such as Greenpeace/Mattel or Bank of America's debit fee). Rather, all of these blunders are something entirely different--companies deploying marketing strategies and tactics that consumers reject, resulting in brand damage. Prior to the social era, it was damn near impossible to have a marketing campaign head south. About the worst that could happen was nothing--a brand might waste its marketing budget on a campaign that fell flat and failed to move consumers. Nowadays, every month brings another story of a marketing campaign that not only fails to help the brand but bites it. It is at this point in similar blog posts about the state of marketing that the blogger usually says something like, "In the social media era brands cannot control the message, but in reality brands never could." That is a nice narrative--and it is complete horse manure. Whether it was the power of mass media, unsophisticated consumers or a society more willing to trust authority, the truth is that marketers wielded incredible power back in the day. Thanks to pervasive and often misleading marketing, consumers thought smoking was safe and pale skin was unhealthy for decades before the dangers of cigarettes and suntanning were revealed. Just look at Kodak. They were the poster child for how marketing can create a brand. More than ten years ago, I read an article on branding that contained a line I still recall: "Kodak is memories; the other guys are just film." That was pure, marketing success--a generic product with a powerful brand that delivered decades of protected market share and higher margins. Today, Kodak is bankrupt. Branding expert Al Ries believes Kodak's problem was not that they failed to adapt to the digital era but that "Kodak means 'film' photography; Kodak doesn't mean 'digital' photography." I believe Ries is wrong--if brands were that inflexible, then Apple would be a defunct desktop computer manufacturer instead of the company that just reported a record quarterly profit of $13 billion derived mostly from sales of music, music players and phones. The comparison between Kodak and Apple is instructive. Almost every single person who reads these words owns an Apple product, I'd venture, but what about Kodak cameras? I am a photo buff who bought thousands of roles of Kodak film in my lifetime, but I'm on my fourth digital camera and have never once been tempted to purchase a Kodak camera. They were never as small, fast, affordable or feature rich as comparable Nikon, Canon and Fujifilm models. In fact, look at ZDNet's annual holiday buying guides for compact digital cameras in 2008, 2009, 2010 and 2011: out of the thirty cameras listed, just one is from Kodak. The problem that Kodak faced--that all brands face today--is that marketing in the social era increasingly works only for brands that first furnish a positive experience. In the social era, marketers can amplify brands that create positive experiences with products and services, but great marketing cannot save mediocre products and services. If the company is unable or unwilling to differentiate the product or service experience, what is left for marketers to do? For brands with little positive sentiment to amplify and an army of empowered consumers ready to pounce at disappointing products and clueless marketing, the best marketers can hope for is to build buzz not about the product or service but about the marketing itself. "Don't like our burgers? Then here's a free social game that will get you buzzing about something other than our burgers." Marketers for undifferentiated products and services can create retweets, likes, comments, engagement and shares--everything except actual improvement in consumer consideration, intent or purchase behavior. Certainly, there are some great recent examples of marketing that works. I've been impressed with the work being done by P&G, RadioShack, USAA (my employer) and others, but their success begins with the right product and service. P&G's Let Her Jump campaign would not have soared if women didn't trust Secret antiperspirant; RadioShack's #UNeedANewPhone hashtag campaign would have backfired if the retailer didn't carry the phones consumers wanted; and my employer's evocative TV ads wouldn't create trust if our service failed to earn trust in the first place. In recent weeks, USAA has been named the top firm in Forrester's Customer Experience Index, ranked by JD Power among the top auto insurance companies in customer satisfaction, and named a People's Choice insurance company in a study by Insure.com. At USAA, marketing is the icing on a cake baked with great products and services. Marketing is creaking like an aged man leaning on a cane. The real power to create or destroy brands now rests with product managers and service leaders. If marketers are unable to influence the strategies, investment and staffing that impact customers' product and service experience, they are (much like Wile E. Coyote) running in place in thin air, hoping to gain traction. I've argued my case. Now I'll repeat the question at the top of this blog post: Should I be embarrassed by my December 2009 blog post, "2010: The Year Marketing Dies"? Feel free to shame me in the comments of this blog post. There is a little story behind my post, "2010: The Year Marketing Dies," that you may find interesting. Shortly after accepting my offer from Forrester's Interactive Marketing team, I received a call from my new boss about a change in their blogging policy. The research firm wanted analysts' content and wisdom in one place rather than spread across hundreds of personal blogs, and so they asked me to give up my personal blog and instead write for Forrester's Interactive Marketing blog. The strategy made sense, but I was concerned Forrester might not appreciate some of my wilder material. My new boss assured me that Forrester had no interest in censuring bloggers, so to test the waters, I decided to write a blatant provocation: as my first blog post as Forrester's new marketing analyst, I announced marketing would die in the coming year. I shared my proposed blog post, confident a speedy rejection was forthcoming; instead, the blog post was approved without edit. It was a terrific sign as I started my new job that Forrester would be a great fit. And it was! That blog post may have been intended as a deliberate affront, and I admit I was exaggerating the point, but I'll still stand by that article. Marketing professionals need to help firms build their brands first with products and services and second with advertising, influencer programs and imaginative social media marketing campaigns. "It is important to note that I am not citing cases of mistakes or service blunders that became social media disasters (a la PayPal/Regretsy, Chrysler's F-bomb or GoDaddy's Elephant-Killing CEO). Nor are these examples of consumers taking to social media to rail against corporate policies (such as Greenpeace/Mattel or Bank of America's debit fee). Rather, all of these blunders are something entirely different--companies deploying marketing strategies and tactics that consumers reject, resulting in brand damage." Like USAA's (the organization for which you serve as social media director) own choice to discriminate against gay and lesbian servicemembers and their families, for example? Or your broken promises to investigate the issue and get back to numerous customers who have inquired about the issue since last Sunday, for example? You're right, social media can be a dangerous tool. I cannot respond to your concerns on my personal blog. As you've no doubt noticed, USAA has gathered some more information and responded to you and others on our Facebook wall. I hope you received the answers you wanted. Very interesting article. Again you rail against the same marketing tactics I find ineffective. I believe a great example of your idea that marketers bring more relevance to a company's products or services can be found with Sun Trust Banks' social media efforts. Check out this Brian Solis interview on how Sun Trust evolved from an silo organization to a enterprise organization: http://ow.ly/8HzNA . Thanks Dean. That is an excellent example of building a brand through real experiences and not social media marketing campaigns! It's just sad to see that the marketers, who are supposed to be in charge of the process, are being overridden by others not as skilled in the matter. It really doesn't make sense at all. Logic says to leave things to the experts. Besides, that would undermine the whole purpose of a company hiring marketers in the first place. Your New Year's Resolution for 2012: Write!